A scene from Nevermore. Photo by Joan Marcus. BOTTOM LINE: Although designers may appreciate the elaborate steampunk costumes, this Edgar Allan Poe musical neglects its subject, reducing it to a series of basic bullet points. And while rebranding a literary figure seems as good an excuse as any to wear fabulously ghastly makeup, staging the Sparknotes version of his life misses the point. Jonathan Christenson, the show’s writer, composer, and director, has opted for a biography delivered in simpering verse instead of using Poe’s actual text (other than a monotonous rendition of “The Raven,” his most famous and reportedly least favorite poem). While both dialogue and lyrics might secure a high SAT score, their relentless structure makes each rhyme land with a predictable thud. Christenson’s prerecorded music glides between a plunky mysticism and Wildhornian bluster. 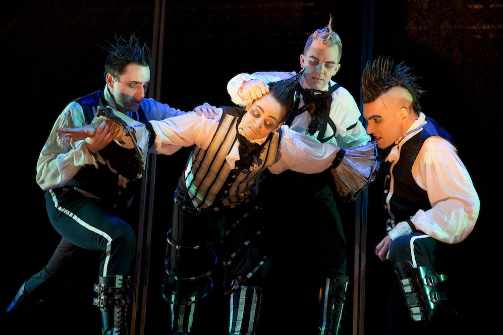 Although several beautiful harmonies emerge, the actors remain as chained to the lyrical structure as they are to the show’s stylized movement. Choreographed to within an inch of its life by Laura Krewski, Nevermore’s greatest problem is its refusal to cop to a single glimmer of humanity. Scott Shepley hints at Poe’s inner demons with wide eyes and soaring falsetto, but every time he strays toward genuine melancholy, Krewski yanks the actor back into yet another chassé. Bursts of improvised humor from the six narrators, as well as tantalizing flashes of Gerecke’s horrific horses, ravens, and imps, provide welcome surprises because they aren’t confined to the production’s militaristic whimsy. One moment of cutting the puppeteer’s strings and letting the cast move and breathe as people would have more emotional resonance than a thousand inept symbols; instead of a gigantic bottle, for example, why not channel the incessant choreography to express Poe’s alcoholism? This musical’s tagline reads, “The Imaginary Life and Mysterious Death of Edgar Allan Poe,” but when the poet’s life becomes a series of inert “and thens” while his death goes uninvestigated, it’s clear this production is far more interested in eye-popping frivolity than the man himself. Rather, Nevermore presents the experience of Poe, or the idea of him as imagined by someone armed with little more than the contents of his Wikipedia page.